I haven't been too interested in the upcoming The Muppets movie, having been treated to decades of mutilation of the Muppet franchise. I also haven't been too interested in The Girl with the Dragon Tattoo movie. 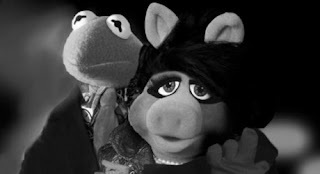 These two disinterests came together when I saw the recent trailer for the Muppet movie making fun of the recent trailer for Dragon Tattoo. Frankly, if the actual Muppet movie is as funny as this trailer, I am so there. First, if you haven't seen the Dragon Tattoo trailer, check out 1:39 of "what in the..." quick-cut action. Now watch the Pig with the Froggy Tattoo. And laugh. What do you think of the trailer? Will it make you watch the movie? Thanks for this article. This is very helpful to me as im researching about this topic and glad i found it here. I will use it for my future reference as well. Nice article. Its worth to read and easy to understand. Thank you for sharing your informations and idea. Very interesting article. Thanks for your excellent post.